Creative stage lighting design can be daunting to those starting out because, aside from the necessary technical understanding, it is essentially a game without rules. On Stage Lighting considers how the novice lighting designer can tackle such a game. Unlike the physics and the technicality and the budget and the time, facing the creative element of lighting design can seem to beginners like looking at a vast expanse of blank nothing, hoping for a clue that helps for better design than simply “making it up.” To help fill in this blank, it helps to be able to grasp certain parameters on which to hang the creative elements. Basically, to have some rules. 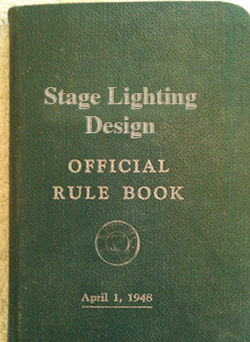 But what are the rules of lighting design? The first thing to accept is perhaps that, while lighting design itself may have no rules, this lighting design is going to have some. Today we are talking about creativity rules and not the number of dimmers you have or the trim height of the rear truss. Why do what you do as a Lighting Designer? “What is my motivation?” has become a bit of a cartoon cliche for the archetypal dramatic thespian. However, motivation is why we do what we do creatively, even Lighting Designers. In theatre, clubs, events or concerts, every element of lighting has to have a reason for being. A reason for changing or not changing. There are some easy wins in a quest for the rules in lighting design. For example, in naturalistic theatre lighting design (or even lighting for camera) a large motivating factor is the space and place of a particular scene. This exterior scene is in France, midday in August etc. That scene is in a Victorian workhouse at midnight…. The rules here are easy to grasp, not only for the LD but also for the performers and the audience: The sun is not purple or come from the floor, midnight in that workhouse does not look like fluorescent hospital lighting. This kind of replication of “real” lighting is perhaps the easiest for the LD to lock onto as the language of light in the world is easily analysed and is also recognisable to others. It is innate to life on Earth. Naturalism is often where new theatre lighting designers make a start and find comfort during those early designs. Often, the creative rules of lighting design become apparent by what something is not. In the corporate world, the backing to the CEO is unlikely to beg to be lit with the colour of the rival company or clash with the colour of the presentation on screens. When the speaker is earnestly outlining last year’s losses, even the most insensitive lighting designer is unlikely to break out the bally hoo that was parked up for the company awards later on. An interactive round table workshop does not call for a darkened auditorium and a single narrow spotlight on stage. Music too has its own rules, however subconscious. In lighting terms, hi-hat diddles do not look like kick drums or rimshots. The lead guitar line does not look like the bass groove and an intimate acappella song is generally not met with a full up, open white full stage wash and audience blinders throughout. A blue song is not an amber song. Trad Jazz and strobes don’t really go together, however much one might like them too. Not only does everyone involved in the show know this, but the audience does too! It’s just wrong. With certain shows, you may find yourself in a situation where the easy wins are not so easy and even the negative rules are hard to pin down. A good example of this could be a theatre play produced in a way that is not naturalistic. Anything is possible. In order to face the creative abyss that is once again life without rules, perhaps you might make some rules for yourself in order to make a start. With abstract set designs, particularly very solid and ‘present’ ones, you could choose to force the rules of naturalistic lighting onto the environment. This can be quite a risky option and finish up looking like the lighting equivalent of playing your instrument in a different key. Simulated sunlight may seem a lot less appropriate when sharing the stage with a giant, bright red cube! What to do? Do you try to make the cube disappear and continue to pursue that sunlight, hoping that midday will materialise before your eyes? As the traditional model for producing theatre means that the scenic design is all but finished before you start work, perhaps you can get some clues as to where these elusive rules for this lighting design may be found from the environment itself. You have materials, shapes, colours, spaces already chosen for you to respond to and you should at least try to play in the same key as the rest of the instruments. Whatever you are lighting has a unique personality. It might be the text, the vibe of the day or the track. It might be the bodies on stage or the gaps between them and if you are to make your own rules, you need to identify those things that contribute to this personality. Perhaps one section of the song is like another section or a scene is dramatically similar to an earlier scene even while they are not physically located in the same spot. Maybe the relationships between those on stage have characteristics that provide handles to grab onto in order to make a lighting rule for that relationship. If this band have a particular way of playing at different points, which angle or distribution is the signature for this? This is not about trying to create formula but it is about responding to the material and the crowd in a way that enhances the show and helps everyone make sense of what is happening. Otherwise, you are just flashing lights. If the conference focus shifts after coffee break then could we shift with it and then return later at the close of play as the business of the event resolves? What colour is coffee time today, anyway? Is it comfortable coffee break or disruptive coffee break? Are any of these changes fast and bold or slow and imperceptible? Should there be a change at all? As we’ve seen, the rules on which to hang out creative product in lighting design may be made for us but sometimes they are more elusive. If “design” is art with a purpose then it can be hard to make a meaningful contribution until that purpose is identified. Even chaos itself could be said to be a rule and if you are to be chaotic, make it motivated chaos. If you are struggling with your design, first ask “What are the rules today?” and if you don’t find many then make a few more up to help you get started. You can always break them later. Image based on photo from Lumachrome via Flickr. A really good, important and essentially simple article. Whatever you’re lighting needs a reason. Yes, simple, but essential thinking. Do you authorize me to translate it in Italian for my blog http://www.walterlutzu.it?